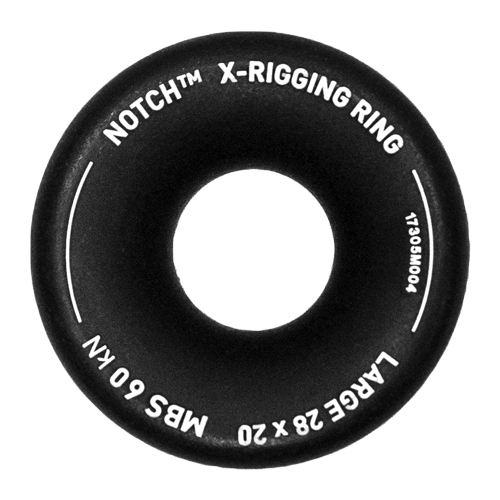 Brought to the tree industry by David Driver, the X-Man, the X-Rigging rings are simple in concept, yet brilliant in function. The rings are made with milled aluminum, hard-coat anodized, and then polished–making them strong, durable and low friction. The uses for rigging applications are many. Redirect, fair lead, speedline, you name it. The possibilities are as varied as the gals and guys removing trees! Through the use of strategically placed X-Rigging rings, riggers aloft can devise rigging systems that work with the tree’s natural strength and structure. Rope and rope angles can be managed in and around the tree, in and out of blocks and other rigging points. Weak points can be strengthened or avoided. Loads can be placed in compression on the tree, and trees can be removed safely and effectively.